Fans of Raimi’s pre-Parker work weren’t surprised. His career began with a string of cult classics—the “Evil Dead” trilogy and “Darkman”—full of his signature sense of humor, hyper-zooms, cheap special effects and copious amounts of blood. His filmography reveals entry after entry of genre pulp featuring characters dealing with life-changing events. While Raimi’s most well-known variation on that theme might be “Spider-Man 2,” his best is “A Simple Plan,” a slow-burning crime drama that opened in a handful of theaters 20 years ago. A limited release that expanded from December 1998 to January 1999, “A Simple Plan” is Raimi’s most subtle, unstylish movie to date. 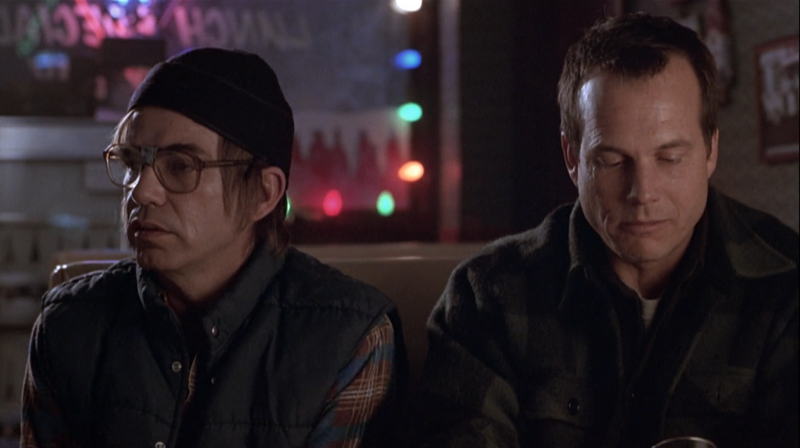 Bill Paxton stars as Hank, a small-town husband and soon-to-be father who works at a feed store. Luck changes for Hank as he, his brother Jacob (Billy Bob Thornton), and their friend Lou (Brent Briscoe) find more than $4 million in an airplane that crash-landed in the woods. Small-town good ol’ boys turn into small-town criminals as complications pile onto the trio’s naive plan of keeping the money hidden from authorities. Such a movie was different than anything Raimi had previously done. In a 1999 interview with Duane Dedek at the Milwaukee Journal Sentinel, Raimi said “A Simple Plan” was his first attempt to put the script and acting ahead of his blood-soaked, B-movie style. 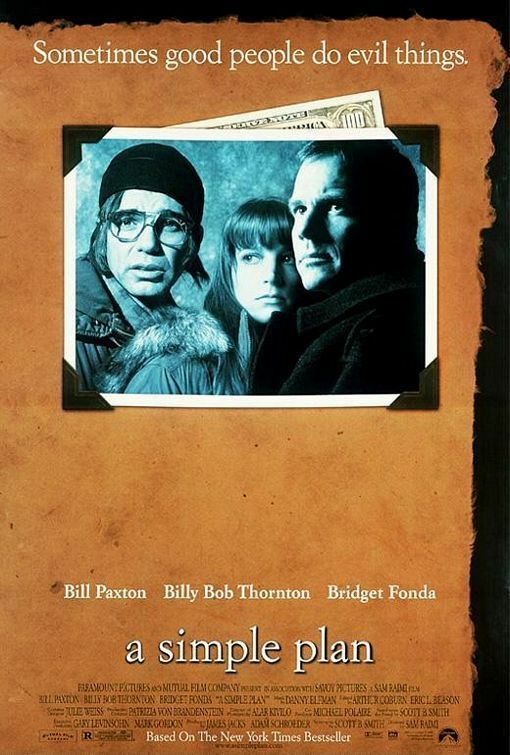 While “A Simple Plan” underwhelmed at the box office, critics including Ebert called it “one of the year’s best films.” Further validation came when it picked up Oscar nominations for its screenplay (by Scott B. Smith, adapting from his 1993 novel of the same name) and Thornton’s supporting turn. Raimi should get as much credit, not for “sitting back” as he suggested in that interview, but for using his style to his advantage. “A Simple Plan” is still very much a Sam Raimi production, from Danny Elfman’s score to use of dissolves; from panic-inducing tension to splatters of blood. However, those tricks aren’t over-exaggerated, nor do they distract. 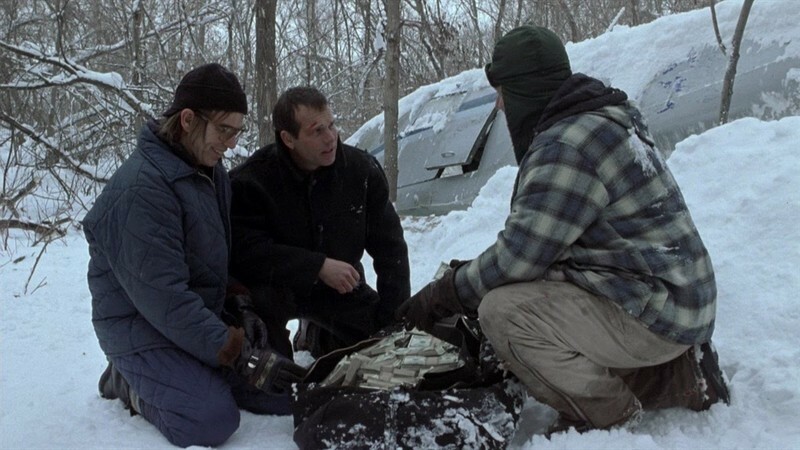 Within the first 15 minutes of “A Simple Plan,” Raimi establishes the barren, snow-laden setting. The good-intentions-gone-bad theme appears as a fox captures a hen. Raimi juxtaposes the fox’s hunt with the introduction of Hank, a broad, idyllic man who follows the wisdom of his father. After Hank visits his parents’ grave with Jacob and Lou (a town drunk who would rather piss in the snow than pay his respects), Jacob nearly runs over the fox. Jacob swerves, crashing his truck into a tree. Jacob’s dog chases after the fox, leading the three men to snow-covered plane surrounded by ominous black crows. As Hank enters the plane to further investigate, crows panic, clawing at Hank. A frozen-dead body stumbles off the pilot’s seat, its hardened blood crashing to the floor. After the scurry, Hank comes out of the plane with a couple scratches and a bag full of money. At each turn in this setup, Raimi jolts the audience with his trademarks—a few zooms, jump scares and a little gore. However, the rest of “A Simple Plan” is rooted in examining the consequences of a literal jackpot falling in these characters’ backyard. As Ebert noted in his review, the advantage Raimi has here is a flawless cast with players who own their roles. As Hank, Paxton plays the generic family man turned aspiring thief. Hank is a guy with values, spouting lines like, “You work for the American Dream. You don’t steal it.” However, newfound wealth makes Hank determined and manipulative. After finding the money, Hank quickly becomes hellbent on convincing his wife Sarah (Bridget Fonda) to go along with his plan. Paxton’s gee-whiz attitude helps sell Hank’s breathless lies. Hank frantically takes control of the situation as each new hiccup arises. No one—not family, Lou, a suspicious neighbor, the town sheriff (Chelcie Ross) or a supposed FBI agent (Gary Cole)—will get in Hank’s way. For an actor tied to delivering memorable lines like “Game over, man!” in “Aliens,” and playing support to spectacles in “Twister” and bigger casts in “Apollo 13,” “A Simple Plan” is Paxton showing his range. He plays up his blue collar attitude while trying to hide darker motives. In Jacob, Thornton embodies a depressed, virginal drunk. The lonely, older brother to Hank, Jacob has nothing, save his dog, spare mattress and messy apartment. Jacob casually admits these details as a way to confess that keeping the money is as worthless as his life. On paper, Jacob reads as the typical Thornton character: the good-hearted loser with a drinking problem. In contrast to Thornton’s profane and loud turns in “Bad Santa” or “Goliath,” Jacob is soft-spoken and aloof, helplessly stuttering, puttering and wincing. For those who think Thornton always plays the badass, Jacob is the direct opposite, revealing the actor’s too-rarely-tapped range. “I mean hell, Hank, I’ve never even kissed a girl,” Jacob says. “You know, if me becoming rich is gonna change all that, you know I’m all for it.” It’s heartbreaking because of the honesty in Thornton’s performance contrasted against how clearly Raimi and Smith foreshadow the tragedy to come. Briscoe, a character actor known for turns in “Twin Peaks” and “Sling Blade,” is the loudest of all the leads as Lou. But his volume is necessary to the story, further complicating Jacob and Hank’s family dynamics. As Jacob’s best friend, Lou is the brother Hank isn’t. “You know we don’t have one thing in common me and (Hank), except maybe our last name,” Jacob tells Lou. “You’re more like a brother to me than he is.” Unlike Hank, Lou keeps Jacob’s attention with silly jokes and stories. Jacob and Lou regularly hang out at bars, taking beers with shots of whiskey. Eventually, Lou bumps into another patron and starts a fight. Such a temperament is a risk to Hank’s plan of quietly keeping the money. Lou could ruin everything, and Hank tries to convince Jacob of Lou’s reckless nature. The days where Raimi would explore such themes with more restraint may be far behind us, too. By 2002, the director found the perfect showcase and budget for his style in “Spider-Man.” He perfected the mix of his signature ingredients (special effects, tension-filled action, casts full of scene-stealing character actors like J.K. Simmons) in “Spider-Man 2.” Raimi does deserve credit for delivering a dramatic, stakes-filled superhero movie before DC and Marvel thought to build its’ cinematic universes. But before Raimi got his Spidey sense, he found space for his style to roam rather than dominate in “A Simple Plan.” Stripped of extravagance and $200 million budgets, Raimi proved he could make a smaller, more dramatic movie that’s as good, if not better, than his cult classics and blockbusters. Hopefully, it doesn’t take him another 20 years to return to that quieter, simpler place.